Housing analyst Laurie Goodman says underwater homeowners need a way out. (MONEY magazine) -- Laurie Goodman is an apolitical number cruncher who has spent most of her 28-year career out of the public view, studying the minutiae of mortgage-backed securities (MBS) for big investment banks. She's long been a star among Wall Street insiders, however. She holds the record for the most top rankings for fixed-in-come research from the trade bible Institutional Investor. While Goodman concedes she underestimated the impact of the housing bubble's bursting early on, by mid-2007 she was warning investors to prepare for a deep downturn. She prepared herself as well. After her employer at the time, UBS, shut down its mortgage trading desk in 2008, she jumped to Amherst Securities, a small company that serves as an MBS broker-dealer for big investors. From there she's published research that has raised her profile and made her an oft-cited source by would-be housing reformers in both the private and public sectors. 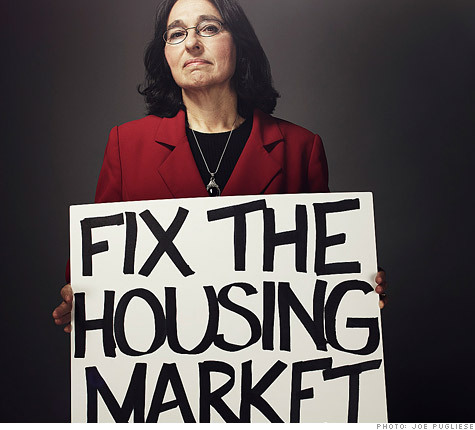 If she is underestimating the problems the housing market has now, we're all in trouble. Goodman often pauses several seconds before speaking, choosing her words deliberately. So it is especially distressing to hear her warn of a potential housing "death spiral." On top of the 2.5 million homes that have already fallen to foreclosure since the bubble burst, another 4.5 million mortgage holders have given up paying and are likely to lose their homes, she calculates. Millions more are underwater -- owing more than their home is worth -- and may give up if things don't improve soon. All told, Goodman warns that more than 10 million of the nation's 55 million mortgage holders could default by 2018. If home prices fall much more than the 6% or so she's projecting over the next 12 to 18 months, the picture worsens, as more foreclosures drive prices down further, in turn causing more sheriffs' sales. Goodman's research into who defaults shows that many governmental and private efforts at saving borrowers -- and reducing investors' losses -- by modifying mortgages weren't helping because they only extended payments or reduced interest rates. They didn't fix the fundamental problem of unsupportable debt loads. Goodman found that investors lose as much as 70% when the homes underlying their subprime MBS are foreclosed upon. Lenders that tried to rehabilitate delinquent borrowers by reducing the principal (or total amount owed) by an average of 26% were far less likely to have to foreclose, and they actually provided MBS investors higher returns. "If you save a borrower, you save an investor," Goodman says. To avoid the "moral hazard" of rewarding foolish borrowers, Goodman recommends that lenders swap immediate principal reductions for shares of any gains on the mortgaged house when it is sold. Many mortgage holders, including giants Fannie Mae and Freddie Mac, are refusing any kind of principal-reduction deals, however. Some don't want to have to take the immediate write-downs that would be required, preferring to delay the financial pain and hope for a rebound. Many servicers refuse to consider them because their fees are tied to the amount of principal rather than to the ultimate payback to investors. And banks often hold second mortgages for the loans that they service. Principal reductions typically require them to take total losses on those notes. In short, banks "are ridden with conflicts of interest" that pit them against the interests of borrowers and investors, Goodman says. "Many of the rules in place now are extremely large-bank-friendly, but borrower- and investor-unfriendly." Goodman's firm, of course, is decidedly on the side of the MBS investor in this fight. Nevertheless, ideas she's been advocating since 2008 are catching on. The Treasury Department and several state attorneys general are encouraging lenders to offer principal-reduction options. And "shared appreciation mortgage" (SAM) modifications have won support from big thinkers such as Nouriel Roubini, the New York University economist who warned of a housing bubble in 2005. Roubini, who cites Goodman's work in his own, recently co-wrote a report suggesting that SAMS could help "unclog the real estate and financial arteries and restore healthy circulation." At least one private servicer, Atlanta-based Ocwen Financial Corp., has started to try this "share the pain and gain" option. "Progress is slow," Goodman says, "but I feel like I am getting some traction." For taxable accounts, Goodman likes municipal bonds. In an IRA, she says, mortgage securities backed by Fannie or Freddie (now propped up by taxpayers) are more attractive than corporate bonds.